The longer I live, the more I appreciate and respect the mysteries of nature. For as much is known about nature, I'm still amazed at how many fascinating unseen 'views' of mysteries are unveiled regularly. We see it in every aspect of the rock, gem, mineral, fossil, and lapidary community on a regular basis. And what an exceptional honor that is. I would also say discoveries and unveilings of these mysteries occur almost daily at the intersection of lapidary and silversmithing. Again, what an exceptional honor to be witness to that type of fusion. In this installment of Artisan Alley, we learn of the inspiration behind five stunning pieces created through collaboration. 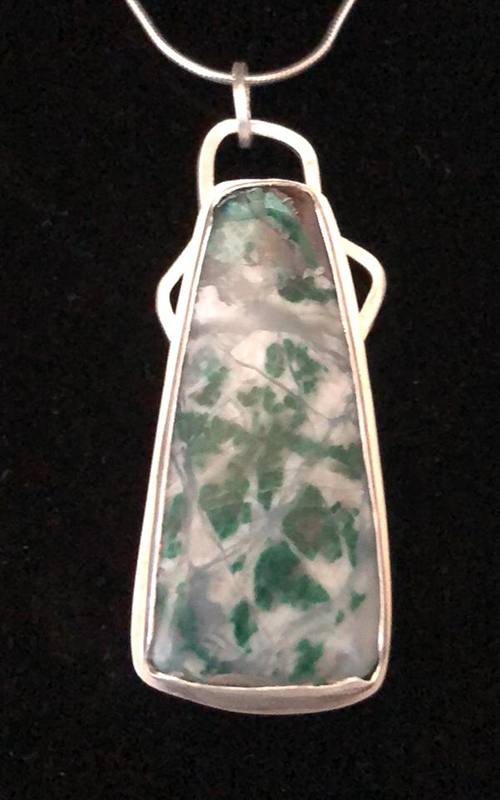 The brilliant pieces showcased in the Artisan Alley blog/column are the genius of silversmiths and lapidary artists who are members of the Stone and Silver Facebook group. As is often expressed by the lapidary artists and silversmiths behind the featured pieces of this column, there is a little bit of the person who is making the piece that is represented within. Silversmith Barbara Bureker discusses this as she explains the inspiration behind the Wanong dendritic opal pendant she created, which features a cabochon by Sherri Dougan. 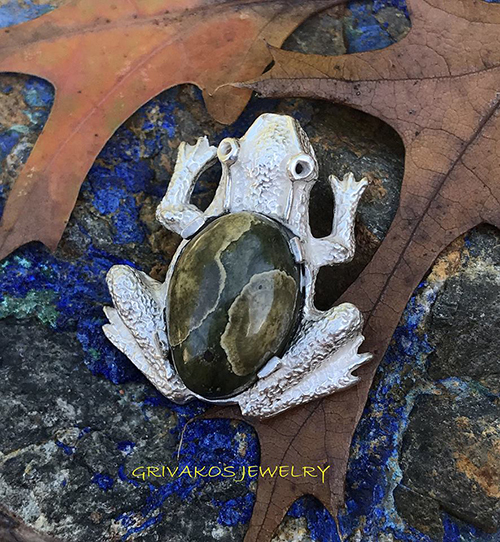 “As I designed the pendant for this wonderful cabochon, I knew I wanted the stone to really shine without too much distraction. At the same time, I have to put something of myself into the jewelry I make; I have a really hard time just putting a stone in a bezel and calling it good,” she said. Explaining further, Bureker shares how each element of the piece serves an important purpose and its presence is valued. Her partner in this collaboration, lapidary artist Sherri Dougan, speaks about her inspiration being the color of the stone. 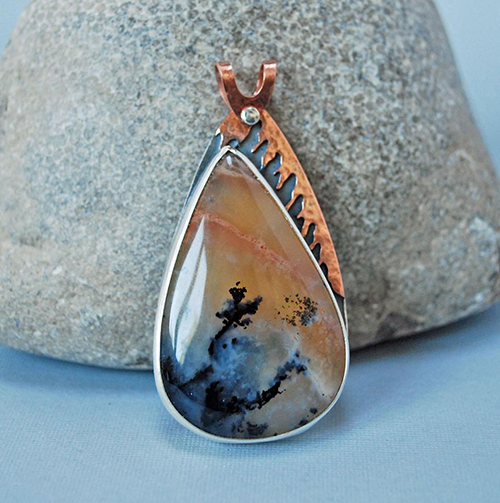 “The colors of this stone worked so well with the dendrites i just had to do this lovely drop shape,” states Dougan. If the phrase ‘it takes a village’ hasn’t been used often within the lapidary community, I’d be surprised, and would suggest people consider it more. A perfect example of the power of collaboration is present in this necklace. As Sandy Wiltzius Morris explains, the idea for the piece began with the beads. 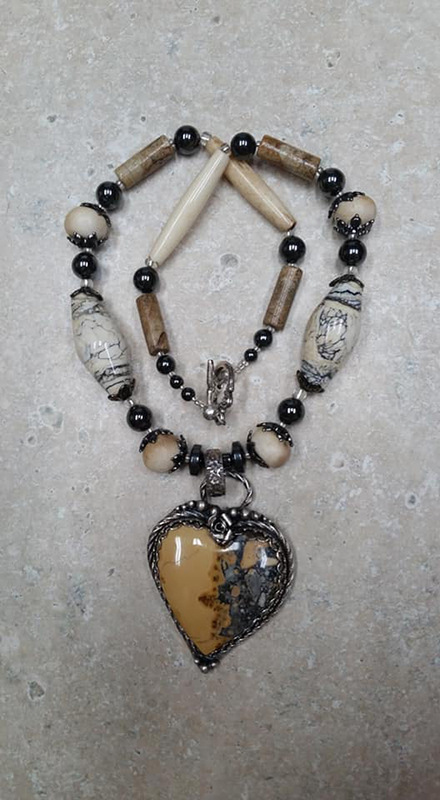 “My inspirations for the total piece were the beads I got from Cindy Erickson of One Big Tree Designs, and the pendant that Shari Blackswan Windsor smithed,” she said. 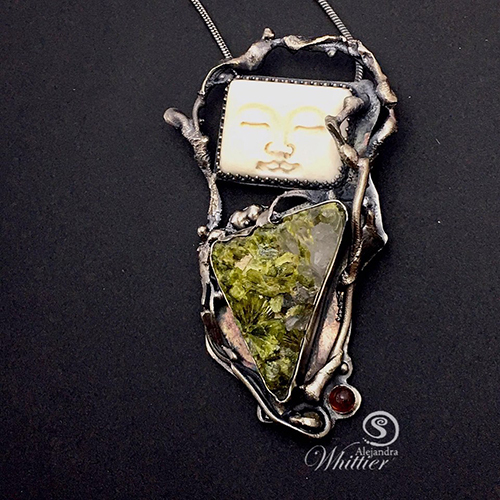 For lapidary artist Armi Priyati, the jasper material provides a balanced presence, and is core within the inspiration for her work in this necklace. Interpretation, even in something as detailed as the pieces of this necklace, lends to the creativity and the meaning. In addition, sometimes the inspiration is an approach that seems perfectly suited for a specific piece. Such was the case for Cindy Erickson as she created the beads that began it all. She went on to explain another stage of this technique. Another often cited source of inspiration is nature. That’s exactly what came to mind for silversmith Alejandra G. Whittier when she saw the uncommon cabochon made by Judy Burmesiter. For lapidary artist Judy Burmeister it was more internal. Sometimes the inspiration is not physical, but metaphysical, as Chris Deschene Goyette explains in regard to the inspiration behind this piece. Simplicity is sometimes the greatest source of inspiration and creativity, as Liz Cain Dicken attests. “This stone brought to mind seeing green leaves through a window with white sheer curtains so I kept the shape simple to keep the focus on the malachite “leaves,” she said. Working off the idea of a collaborator also often drives the process, as lapidary artist Teddi Giannakopoulou explained. 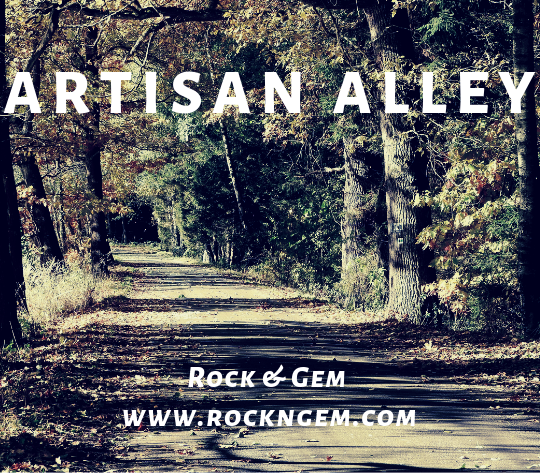 Be sure to look for new Artisan Alley showcase blogs/columns each week.